What is the Purpose of a Medial Branch Block Injection? When it comes to neck or back pain that is chronic, medial branch block injections serve two different purposes in pain management. On the first hand, medial branch blocks work great as a diagnostic tool. 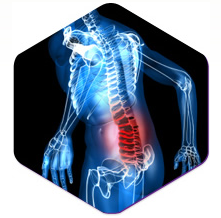 With back or neck pain, it can be difficult to delineate which level of the spine is generating an individual’s pain. The reason is that the facet joints of the spine are small, about the size of a thumbnail. There is one on each side of the spine at every level, and if arthritis is present in one, it is probably present in multiple. The Las Vegas Pain Management Doctor will begin to figure out which level is the pain generator with a history and physical and imaging studies. The medial branch block can help finalize the diagnosis of where the problem actually lies. Cervical facet joints are located at every spinal level of the neck on each side. The second purpose of the medial branch block is for therapeutic reasons. When the pain doctor places numbing medicine around the painful joints near the area where the medial branches come into the joint, pain relief can be dramatic. Arthritic joints have a nerve supply, and if that is blocked with the injection, pain relief may be substantial and may be sustained four months. In fact, a large study on medial branch block injections showed that the average amount of pain relief with numbing medicine and steroid over these joints was three months. (Manchikanti et al, Pain Physician. 2010 Sep-Oct;13(5):437-50. It is unclear whether steroid medication is necessary to be injected for longer pain relief. 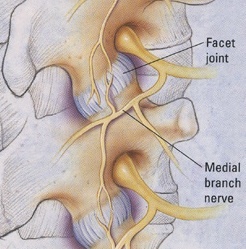 You can see the medial branch nerve ending coming off the nerve root to supply the facet joint with sensation. If the medial branch injection wears off, it may need to be repeated or the patient may go on to have a radiofrequency ablation procedure. This may provide up to 18 months of substantial pain relief and has been a revolutionary procedure. In order to approve the radiofrequency procedure, insurance companies like to see between a 50 and 80% pain relief from the medial branch block injections done prior. 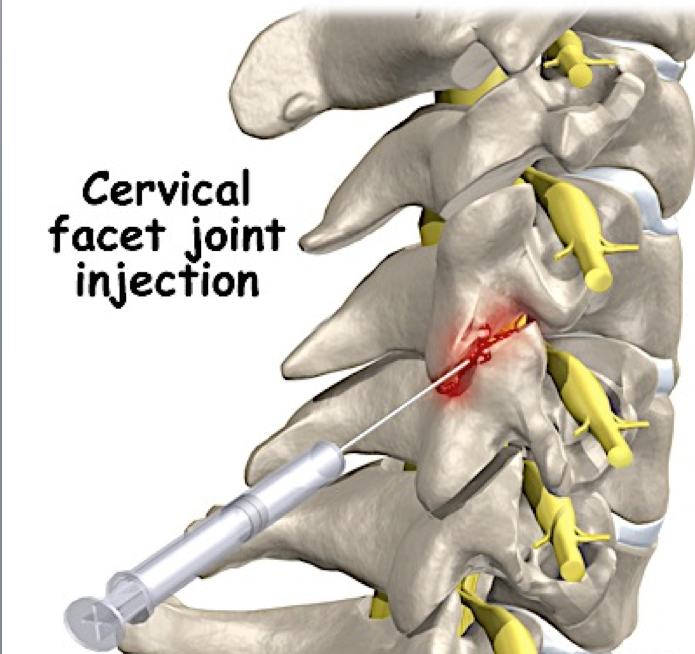 Thankfully, procedures such as medial branch block injections are available when facet arthritis is present. Surgery for facet arthritis is usually a bad idea, since the arthritis usually affects multiple levels. This is very different than a hip or knee, and also there is no current joint replacement procedure available for facet joints. If you live in the Las Vegas or Henderson areas and are suffering from chronic back or neck pain, effective pain management is available. The Nevada Pain Network connects those in pain with the best pain management Las Vegas and Henderson trust. Simply complete the form on the page or call (702) 323-0553 for assistance today!